Temecula is not the first place a person thinks as California Wine Country but that is where Thornton Winery has set up stakes. Temecula Valley is actually an off-the-beaten-wine-path AVA (American Viticulture Area) situated on I-15 about midway between Orange County and San Diego. It is about 20 miles inland from the Pacific Ocean and the blistering heat from the interior valleys to the east of Temecula. This hot air pulls the cooler maritime into the 1500 foot plateau, creating a misty climate to help cool off the vines from the usual sunny Southern California day. This climatic environment combines well with the Valley's granite soil and plentiful sun to make excellent grape-growing conditions. Consequently, wineries have sprung up and Thornton Winery is one of almost forty in the area. Sparkling Wine has been the focus at Thornton since its beginnings in 1988. They use the traditional Methode Champenoise process to make their complex award-winning Champagnes. It is more labor intensive and time-consuming than the Charmant method but it produces the highest quality and effervescent bubbly. And by the way, while the French frown upon anyone using the term champagne and most American wineries abide their wishes, Thornton gives them a raspberry and calls their bubbly wine, Champagne. They produce seven Champagnes with the vintage and non-vintage Bruts with plenty of fruit, yeasty notes, and crisp bites of acidity. 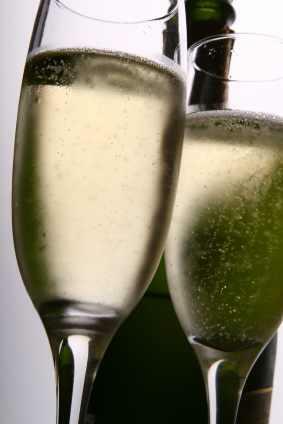 There is also a traditional Blanc de Noirs made from Pinot Noir with a hint of salmon color. So far, standard Champagne fare, but then Thornton veers a different course and produces a couple of quirky and interesting sparklers. One is something called Almondage which is a sweet sparkling wine with almond added during fermentation -- it's a kind of Amaretto with bubbles. The other is a Cuvée Rouge which is a blend of Grenache and Syrah, a sparkling Rhône-style Champagne. Still varietal wines are not shunned at Thornton either; they produce both white and red wines that favor Mediterranean and Rhône varietals. You can enjoy the usual Chardonnay, Sauvignon Blanc, and Viognier. The Chardonnay should resemble the usual California version with tropical fruit, melon, and toasted oak vanilla. The Sauvignon Blanc shows more of the crisp tropical fruit and citrusy acid with a dose of grass and flinty minerals. The Viognier is an inviting alternative to Chardonnay and takes its cue from the Northern Rhône's Condrieu with silky mouth, floral perfume, and pear fruit. Thornton has a lot of interesting reds to choose from. There's a Sangiovese and Sangiovese Rosè made from the Italian grape mainstay. The winery produces Cabernet Sauvignon that is blended with Cabernet Franc and Merlot that sticks close to the big tannin style from Northern California. There's a Merlot for those that like the softer side of a Cab, a Syrah with rustic berry flavors and silky tannins, and also a Late Harvest Zinfandel for those that want a dessert wine to go with that dark piece of chocolate. They also produce a couple of blends concocted from various Southern Rhône grapes such as Grenache, Syrah, Cinsault, Mourvedre, and even something that is a cross of Sangiovese and Barbera. A contemporary restaurant destination with gourmet cuisine. Thornton also offers special Winemaker Dinners thematically arranged to marry their cuisine to highlighted wines. This is a concert series with top jazz musicians. Concerts are al fresco on the terrace with a view of Temecula Valley. Concert tickets are packaged with or without a 3-course dinner. Sorry, Thornton beverages are additional. The winery has facilities available for weddings, banquets, and corporate events. So, whether red, white, blue, or bubbly, Thornton has a wine to appeal to almost any oenophile persuasion. When you are near Temecula it's worth a stop to visit; when you see a Thornton on a restaurant's wine list, it's also a good chance to try a wine from a wine region few knew existed. Indulge and enjoy.